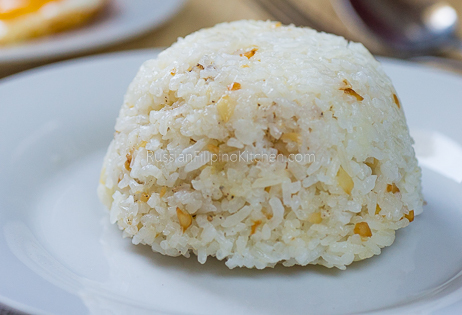 Sinangag is the Filipino word for “fried rice”. Rice used is usually from previous day’s leftovers stir-fried and flavored with chopped sausage, eggs, veggies such as carrots and peas, and seasonings. 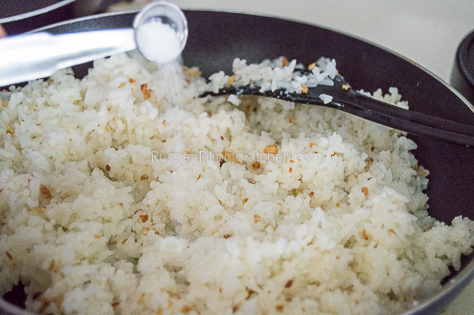 There are different variations of sinangag, among them is garlic fried rice. It’s the simplest and easiest to make as it involves only a few ingredients— leftover rice, garlic, oil, and salt & pepper. In making fried rice, it is important that the rice is not freshly cooked. Meaning, you have to use the one that you cooked the previous night or the day before. 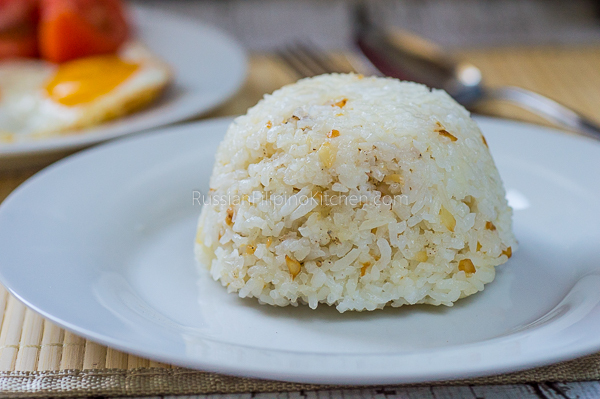 Leftover refrigerated rice is best, although you can use boiled rice as well at room temperature. Just make sure it’s not spoiled. The rice has to be a little dry. Fresh boiled rice is moist and fluffy, which results to mushy fried rice, and we don’t want that. If you love rice and garlic, this one’s for you. It’s perfect to eat with your favorite breakfast sausage such as longganisa, tocino, eggs, dried fish, or bacon. 1. Peel garlic cloves and chop into very small pieces (other word: mince). 2. Heat up skillet on the stove over medium high heat and add vegetable oil. 3. 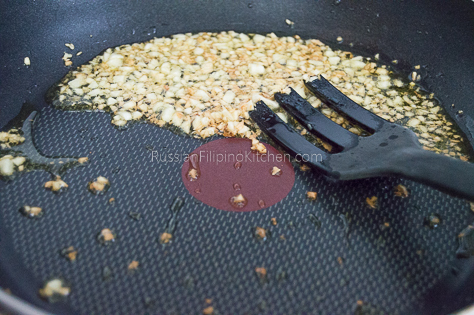 Saute minced garlic until it turns golden or light brown. 4. Turn down heat to low and add the rice. (Note: I usually remove the pan from the stove while I add the rice and mix it halfway, then I put it back. This technique always works for me so I don’t end up burning the garlic. Burned garlic ruins the taste of your fried rice—you can taste the bitter garlic as you’re chewing). 5. Turn the heat back to medium high. Use your cooking spoon to break large chunks of rice and mix thoroughly. 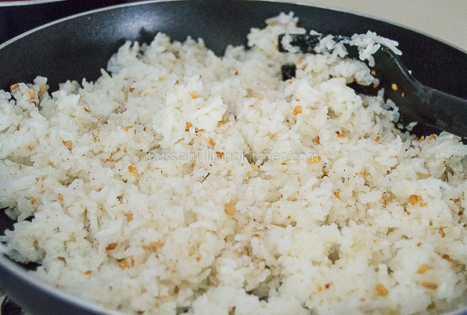 Cook until rice is slightly toasted and garlic flavor is incorporated into the rice. 6. Season with salt and pepper, then mix until seasonings are evenly distributed. 7. Serve warm with your favorite sausage, eggs, or bacon. 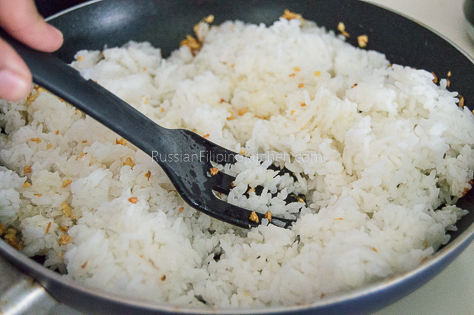 Fluff the rice with a fork before cooking to make cooking easier. 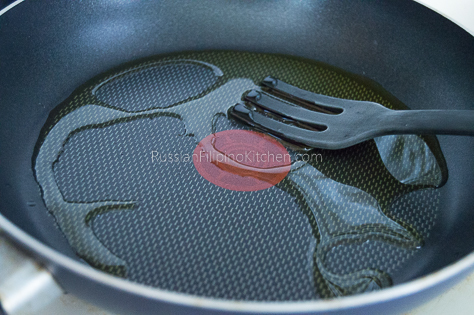 Use a large skillet or saute pan so you have more space to work on. A 10-inch skillet or wider is best. You can use less garlic or more as desired. 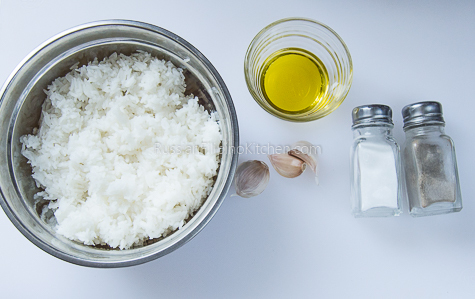 I like making the dish with the ratio of one large garlic clove per cup of cooked rice. Sometimes, I add more depending on my mood. 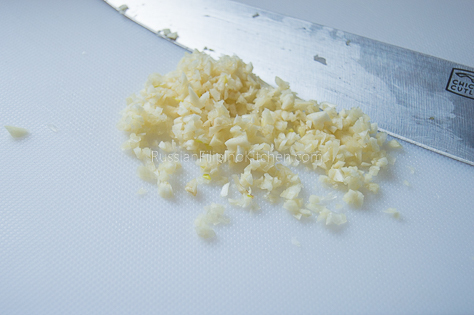 Peel garlic cloves and chop into very small pieces (other word: mince). Heat up skillet on the stove over medium high heat and add vegetable oil. 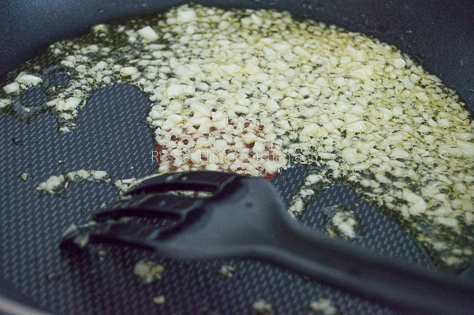 Saute minced garlic until it turns golden or light brown. Turn down heat to low and add the rice. (Note: I usually remove the pan from the stove while I add the rice and mix it halfway, then I put it back. This technique always works for me so I don't end up burning the garlic. Burned garlic ruins the taste of your fried rice---you can taste the bitter garlic as you're chewing). Turn the heat back to medium high. Use your cooking spoon to break large chunks of rice and mix thoroughly. 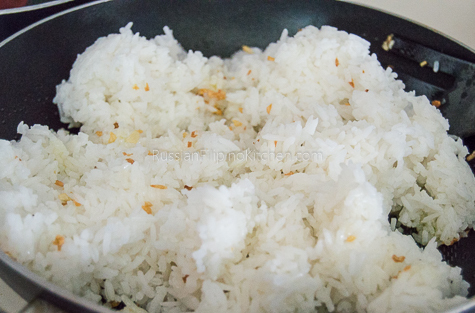 Cook until rice is slightly toasted and garlic flavor is incorporated into the rice. Season with salt and pepper, then mix until seasonings are evenly distributed. Serve warm with your favorite sausage, eggs, or bacon. Fluff the rice with a fork to make cooking easier.